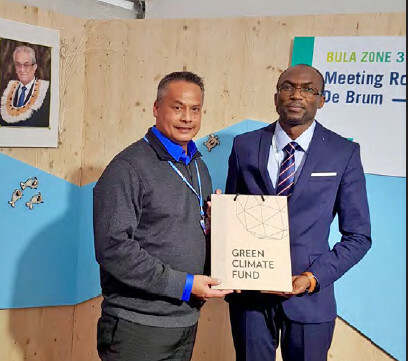 Bonn, 12 November 2017 – The strengthening of a partnership with the Green Climate Fund will help the residents of low lying islands take greater control of their destinies, the Executive Director of the Micronesia Conservation Trust (MCT), William Kostka, said today. The signing ceremony followed the dedication of the Tony Debrum Meeting Room at the Bula Zone of the UNFCCC World Conference Center Bonn. Those in attendance to witness the signing included FSM Vice President Yosiwo George, Foreign Affairs Secretary Lorin Robert, R&D Secretary Marion Henry, Environment Secretary Andrew Yatilman, Palau Minister of Environment Umiich Sengebau, RMI Minister in Assistance David Paul, Minister of Foreign Affairs John Silk and numerous dignitaries from the Pacific and from around the rest of the world. “Enhanced access to climate finance will help us take action to reduce the destruction of extreme weather events, and to improve our long-term planning to deal with a warming planet,” said Mr Kostka during the signing of an Accreditation Master Agreement (AMA). “MCT looks forward to working with our governments and our local communities across Micronesia to jointly develop and submit proposals to the Green Climate Fund” stated Doreen Debrum, MCT’s Board Chairwoman and oldest daughter of the late Tony Debrum. MCT became the smallest organization in the world (with only 10 staff) to gain accreditation to the Green Climate Fund. In 2015, MCT achieved this same feat with the Adaptation Fund. MCT is one of GCF’s direct access Accredited Entities forging low-emission and climate resilient paths in Small Island Developing States. AMAs open the way for GCF to consider climate change projects which Accredited Entities, such as MCT, bring forward for funding approval.